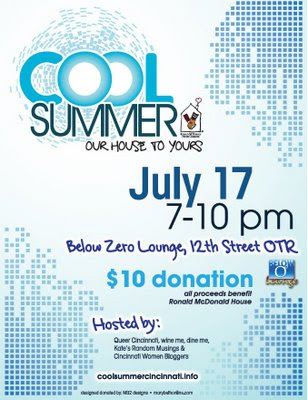 As it turns out, all of the cool kids will be at Over-the-Rhine's Below Zero Lounge this Friday as Cincinnati Women Bloggers and the Queen City's GLBTQ community join forces to support the city's Ronald McDonald House. Kate's Random Musings is proud to join other local bloggers including Queer Cincinnati and Wine Me, Dine Me as sponsors of Cool Summer: Our House to Yours. From 7 to 10 pm, we will sip and celebrate the amazing work happening to help children and families coping with a variety of illnesses at Ronald McDonald House. We're asking guests to make a $10 donation at the door, as well as enter to win a variety of really fabulous raffle prizes. Why should you come to Cool Summer: Our House to Yours? Cincinnati’s Ronald McDonald House offers a supportive “home away from home” environment to families and their children receiving medical treatment at Cincinnati Children’s Hospital Medical Center. The facility has just undergone a 30-room expansion project and now serves 78 families each day as they travel to Cincinnati seeking medical attention for their critically ill children. As the number of families served has increased, so too have the needs for funding, goods and volunteers. We're trying to meet some of those needs, and are appealing to the community for support. Beat the dog days of summer at Below Zero Lounge this Friday evening and hang out with some of the coolest people around Cincinnati. Check out the event's Facebook page to learn more information and RSVP.